Posted on 19, May 2016 by EuropaWire PR Editors | This entry was posted in Automotive, Germany, Sports and tagged Mercedes-AMG Collection 2016, Mercedes-Benz. Bookmark the permalink. STUTTGART, 19-May-2016 — /EuropaWire/ — Sporty and dynamic motorsport textiles, cool shirts for kids, fine leather goods and premium personal accessories: the Mercedes-AMG Collection 2016 features a wealth of new, high-quality products. New additions to the range also include further personal accessories focussing on the Mercedes-AMG GT sports car. 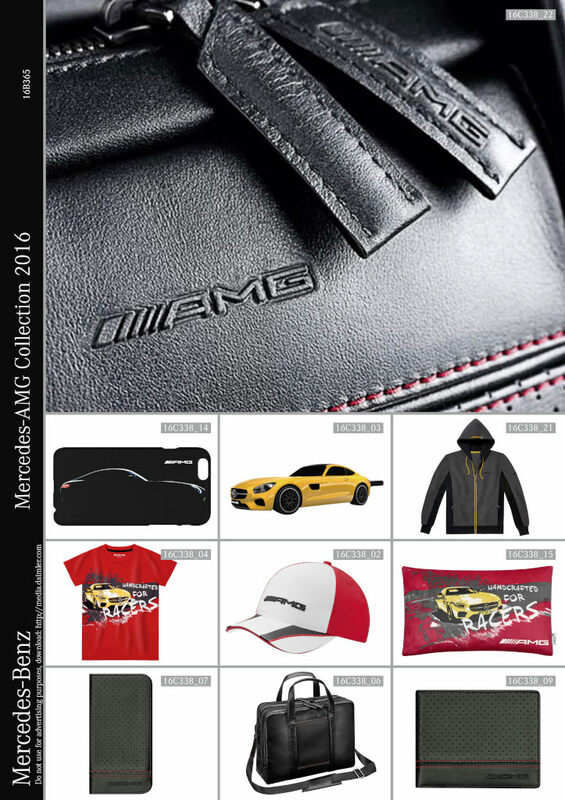 The Mercedes-AMG Collection 2016 is part of the new Mercedes-Benz Collection 2016 catalogue and is available from authorised Mercedes-Benz dealers and partners. Handcrafted for racers, the new T-shirts for kids are brightly coloured in red or neutral in white, each adorned with a yellow Mercedes-AMG GT. Made from 100% combed single-jersey cotton and featuring a practical crew neck, they are exceptionally comfortable to wear. An AMG logo is printed on the back. The T-shirt is available in kid sizes 116/122 – 152/158. Based on the same look, the fluffy kid’s cushion is ideal for snuggling up to. Measuring approx. 43 x 25 cm, it is made of 100% polyester plush. Another favourite for juniors is of course the capwith adjustable metal clasp in a white/red design with embroidered AMG logo on the front. The new softshell men’s functional jacket is a sporty, dynamic hybrid jacket that provides effective protection against the wind. The jacket has a slightly tapered slim-fit cut (sizes: S – XXL) and features a waterproof zip. It has a high-closing collar with chin protector and a detachable hood. Further functional features include two side pockets with zip, various inside pockets, width-adjustable cuffs with Velcro fastenings as well as a cord and stopper to adjust the width. The base colour of the jacket is timeless selenite grey, highlighted with contrasting black, white and red as well as a white AMG logo printed on the breast. It fits well with the new men’s cap made of Tactel – 83% nylon, 14% cotton and 3% elastane. The versatile men’s sweat jacket in selenite grey with yellow highlights available in S to XXL is understated yet sporty. Designed with a tapered slim-fit cut, the jacket is made of 73% cotton / 27% polyester. The zip in contrasting solarbeam yellow closes the jacket securely, while two pockets provide a secure space to keep small essentials. The jacket is completed perfectly by a drawstring hood, matt black eyelets and a two-tone cord plus black ribbed cuffs and hem. Visual highlights are the black 3D-embroidered logo on the left breast, the 3D-embroidered “GT” on the sleeve and the yellow collar with woven AMG logo. Likewise new to the collection are two men’s polo shirts: a long-sleeved shirt in base colour black with white and red highlights, and a short-sleeved shirt in white with black highlights. Made of 100% cotton, they are available in sizes S – XXL. There are not one but two new smartphone covers available to protect the iPhone® 6/6S. The black plastic cover with the embossed AMG GT silhouette and the AMG logo reliably protects the smartphone from shocks, scratches and dirt. The cover has holes and recesses for all the connections and control buttons. It’s therefore easy to switch the phone on and off, control the volume or charge the battery even when the cover is on. The smartphone cover in genuine lamb’s leather is particularly refined. Based on the design of the AMG seats, the black cover features an on-trend perforated look. The leather-trimmed click-in holder makes it easy to insert and remove the mobile phone. Various compartments available for cards and notes round-off the impressive features of this handmade cover. The new wallet, likewise in high-quality perforated lamb’s leather, has a matching design. Red contrasting topstitching and an embossed AMG logo add attractive highlights and round off the harmonious design. Inside there are two note compartments, four credit card slots, three larger compartments for a vehicle document, ID card, etc. and a coin compartment with press-stud fastening. There’s plenty of space for larger items and business documents in the new, black business bag made of perforated leather. With its red contrasting topstitching, it not only scores highly in terms of first-class design, it’s equally impressive when it comes to practicality and comfort. The bag features a large zipped main compartment and various inner compartments. There is also a padded laptop compartment for devices up to 38.1 cm (15 inches) plus a large compartment with a magnetic fastener. The leather loop on the back which can be used for hanging the bag over the towbar of a trolley suitcase and the padded, length-adjustable shoulder strap round-off the features of this business bag. One of the particularly stylish personal accessories new to the portfolio is the 16 GB USB stick 2.0 in the shape of the Mercedes-AMG GT in solarbeam yellow. Those who prefer to build their own solarbeam yellow AMG GT, ideally together with the kids, should look no further than the new 200-piece jigsaw puzzle. Comprising 120 g/m2 linen-embossed photo paper on 1.9 mm blue jigsaw card and a four-colour print with varnish, the completed puzzle measures 470 x 330 mm.